There are many ways to approach securing corporate data. Most tactics for securing data are tied to identity, mobility requirements, cybersecurity concerns or any combination of the three. Data leaks can occur in even the most secure systems if the right precautions are not taken to mitigate the risk. Considering employees share corporate files and documents every day, the challenge organizations are now looking to address is how to control data that escapes “into the wild”. What can we do once the data leaves the secure walls of the organization? What is the risk when sharing corporate data? What is the effect on the organization if the data gets out? 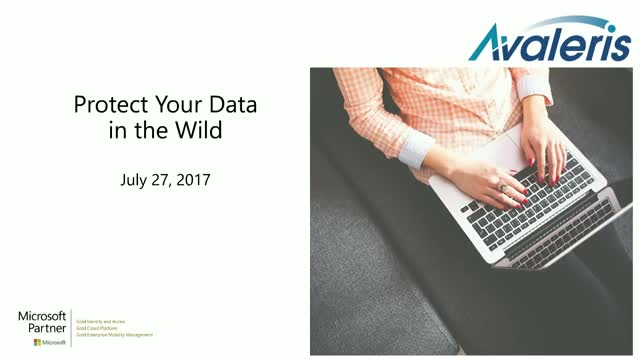 In this webinar, Avaleris will show you how to use AIP to classify and label data and how your organization can control access to it. Fact: only a quarter of organizations are focusing on a digital transformation strategy even though more than 85% of CEOs believe technology will transform their business more than any other global trend. Join Rajesh Thukral, Director of Digital Business Transformation for our latest webinar as he explores the digital imperative – why every business needs to think “digital” and embrace new ways of working with their customers and employees – or risk being disrupted. Digital technologies are defining and disrupting how we think and do business. Come away with industry insights and tools that will let you assess your company’s digital mindset and help chart your own transformation journey. Discover how cloud solutions can help your organization achieve GDPR compliance. Learn from our experienced senior consultant as he demonstrates the vast functionality the Microsoft EMS Suite offers and how it can help you prepare for the GDPR. See how the latest innovations in productivity and security can help you on your journey to GDPR compliance. Never before have organizations so critically needed confidence in their Identity and Access Management infrastructure.The constant barrage of cyber attacks, the exploding number of identities and integrations, and the ever changing technology landscape have all taken a toll on enterprise IT. With their company's security and productivity on the line, teams often struggle to keep up and keep ahead. Staffing remains one of the biggest challenges organizations face when implementing and maintaining Identity Management solutions. Avaleris understands that Identity and Identity Driven Security has become the cornerstone of organizational IT, but hiring and retaining full time employees with the necessary specialized skills and experience is difficult. In this webinar, we will discuss the impact of poor Identity and Access Management and present the numerous advantages of having the experts deal with the related security and operational complexities. Learn how a Managed Identity Service provider can maximize your Microsoft Identity Technology Investments and allow you to focus on the growth and streamlining of the business. Cybersecurity is top of mind for most organizations today, and the education sector is no different. In today’s digital transforming economy, cybersecurity threats and data breaches have evolved, and the way organizations approach protection, detection and response must evolve as well. In this joint webinar, Microsoft and Avaleris will discuss cybersecurity and how organizations can safely increase security on identities in their environments and how they can benefit from securing their identity perimeters. We will draw from real examples in today’s landscape to demonstrate this. Based on the exclusive set of cybersecurity briefings hosted by Avaleris in conjunction with Microsoft, learn how your organization can compete in a digital world while mitigating the risk associated with a changing cybersecurity landscape. • Integration with industry specific applications. Understanding and implementing an effective hybrid identity and access management solution, combined with advanced cyber security infrastructures, are the key to preventing security breaches and data leaks within your organization. Join us for an important session where our experienced consultant will present the benefits of the Microsoft suite of products specific to your sector, and how they can provide a hybrid identity platform on which you can continue to grow your business. As the need grows for organizations to empower users to work anywhere, anytime and from any device, IT departments are looking for ways to protect content and data on lost or stolen devices. Microsoft’s BitLocker program can encrypt your drive as well as help protect against unauthorized changes to your system. It is designed to prevent a user’s data from being viewed, extracted or retrieved in case a drive is lost or stolen, which is increasingly important now that users are becoming more mobile. In our next webinar, we will discuss some of these sobering statistics, as well as the approach Microsoft is taking to information protection and encryption. Discover deployment and planning considerations and understand the value BitLocker can bring to your organization. In this webinar, we ask one of our senior consultants to weigh-in on the newest changes and updates to the Enterprise Mobility + Security suite of Microsoft products, and how those changes can affect your business. Our overview of Intune will include a review of different deployment options while we present sample architectures from business cases drawn from our consultants’ real world experience. Discover how you can use Intune to make your own in-house developed apps available to your employees on mobile, as opposed to using the pre-connected apps from Microsoft. We will explore Mobile Application Management through enterprise application deployment and other deployment considerations. Gain an understanding of Azure AD and MIM capabilities in a number of common identity management scenarios. Learn from real world experiences and apply this knowledge to your own identity management approach. We will engage in detailed discussions where we will compare and contrast several aspects of Microsoft's identity management functionality available on premises and in the cloud. Learn about identity-driven security from a seasoned identity and mobility expert and Microsoft partner. If you were unable to attend our seminar live, this is a webinar you won’t want to miss! This webinar will help organizations understand the Microsoft on-premises and cloud based security architecture and develop a roadmap towards stronger security that they can use to guide their decisions in protecting corporate identities and data. There are a number of security-related questions that come up often in our conversations with clients and industry professionals. We have invited the Avaleris VP, IT Security & Emerging Technologies and three leading security experts from Microsoft to answer these questions and discuss the most pressing identity-driven security issues faced in the industry today. In this panel webinar, hear from Patrick Arnold, Senior Global Director - Enterprise Cybersecurity Group at Microsoft, Patrick Huff, Senior Director, Advanced Service Delivery at Microsoft, and Alex Weinert, Group Program Manager at Microsoft, on issues such as: “If Microsoft gets attacked, what happens to my cloud security products?” and “What is the best way to protect against cyber espionage?”. All attendees are invited to submit their own security questions in advance of the panel and during the live session. Ransomware protection has been top of mind of many of our clients. Join our senior consultant and security expert, Artom Harchenko, for a walkthrough of how to use Microsoft security technologies to prevent a successful ransomware attack. In the case of a breach, learn about telltale signs of ransomware presence in order to protect your corporate data. Artom will be presenting a sample architecture as well as an overview of the technologies involved in ransomware protection. Attend this session to discover Microsoft's Cloud App Security (CAS) as we take you through an in depth demo of this cloud technology . We will explore how Microsoft's CAS allows you to benefit from using cloud applications within your organization, without compromising the security of your organization's data. Let our experienced Avaleris consultants paint a picture of the Microsoft Security solutions from end to end. See the mosaic of Microsoft security tools in this webinar, and we will help you wrap your head around the many solutions available to you and your organization. Learn about the business benefits of Enterprise Mobility Suite and see how it helps empower users to connect anywhere, anytime, and on any device. See how EMS saves the day by providing access while keeping data secure for this CEO. discover the possible architectures and deployment topologies that would help you empower and secure your organization. Learn about techniques of setting up Enterprise Mobility Suite in your environment. Experience first-hand the technology behind Azure AD B2C as we customize and present the interface as it appears to the client, and for the administrator..
Joignez-vous à nous pour cette webinaire gratuit à l'intention des professionnels de la TI du domaine de l'enseignement. Venez-vous familiariser avec les caractéristiques de gestion de l'identité d'AADP et leurs avantages pour le milieu de l'éducation. Hybrid Identity, enterprise mobility and cloud security. Avaleris is a niche Identity Solutions and IT Security Consulting firm. We specialize in helping clients reduce their security risks and solve challenging business problems around Identity Management by leveraging a range of innovative Microsoft based identity and security technologies. Avaleris consultants are focused on providing best-of-breed Identity solutions that enable our clients to deploy stronger and more consolidated Identity Management infrastructure solutions build upon an Active Directory foundation. Avaleris is a core Microsoft Identity & Access systems integration depth partner with experience in working with global clients in North America and Europe.